Meet Puerto Rico President Milton Segarra during the forum. A panel of travel industry experts met this week in Washington, DC to shed light on trends and the ways in which today’s unique set of circumstances have influenced business travelers, leisure travelers, and groups, as well as the economy and society. Convened by Meet Puerto Rico, the marketing organization destination responsible for attracting meetings, conventions, trade shows, sporting events and incentive groups to Puerto Rico, the panel included CBS travel editor Peter Greenberg, John Graham, president of the American Society of Association Executives, Don Welsh, president of Destination Marketing Association International, Tammy Blount, president of the Monterey, CA Convention and Visitors Bureau, and incoming DMAI chair, and Meet Puerto Rico President Milton Segarra. Jack Speer, host of the National Public Radio, moderated the “Traveling in These Times” forum. The topics discussed included the positioning of destinations and its implications for economic development, travel habits of “millennials,” and President Trump’s administration’s travel ban. Other issues, such as recent incidents involving airline passengers, the Air Passengers Bill of Rights, and changes to regulations governing passports and international travel visas were also covered. 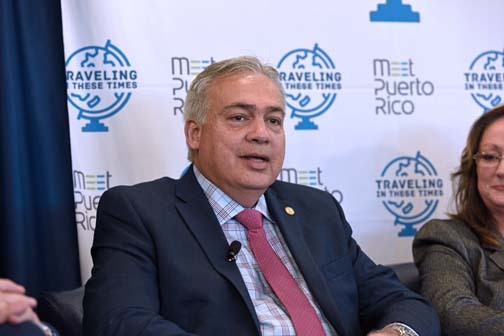 “We called this forum with the intention of inserting Puerto Rico in the conversations that are taking place in the industry to address these issues and participate in finding solutions that allow us to continue providing safe and enjoyable experiences for our visitors,” Segarra said. “It is well known that, given all these changes, we have entered a new state of normality. Security, financial situations, changes in governments, Zika and health in general are some of the main issues that have become trends and as an industry, we must speak the same language,” he added. The panel analyzed these issues, as well as safety and its impact on travel. Even family and business travel have become more complex, prompting the panel to spend time discussing how important it is for destinations to be aware of these changes to better serve their customers and market their offerings. According to the U.S. Travel Association, travel is big business in the United States with 2.2 billion trips made by Americans for business purposes and entertainment in 2015. Travel exports totaled $246 billion and international travel imports totaled $148 billion, creating a surplus of $98 billion in the travel trade. The “Traveling in These Times” forum was held in the First Amendment Room of the National Press Club in Washington, DC. Hey Buddy!, I found this information for you: "Meet Puerto Rico hosts chat in DC on travel trends". Here is the website link: https://newsismybusiness.com/puerto-travel-trends/. Thank you.